Since I ended up reading all three books back to back and as the trilogy is one complete story, I decided to pen my collective thoughts and review for all three books under one post. I had purchased all three titles over kindle partly because of the premise (which I had heard over dinner conversations with friends) and partly because almost everyone I knew had read them. After the purchase, the books stayed unopened for almost an entire year. Dreading that I had made a terrible mistake due to peer pressure I started reading the first few pages of book 1. Little did I know that I would be completing all three books within a week! 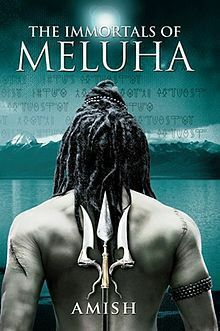 The combination of Amish Tripathi’s writing style, the plot, the mysteries, the characters and the fact that these were the same deities that we have been praying to as children made the books hard to put down. For those of you who aren’t familiar with the plot, the trilogy speculates (quite effectively) that the beings we have come to know as gods were in fact mortals just like you and me and this saga captures the life and times of one such Hindu deity, Shiva. Book 1 introduces us to Shiva as a tribal chief in Tibet who is sought out by a Kshatriya emissary from the glorious kingdom of Meluha in India with the hope (unbeknownst to Shiva) of fulfilling an age old prophecy to vanquish evil. The prophecy of the Neel Kanth! The subsequent chapters continue to introduce other deities from Hindu mythology in a similar mortal light. The prophecy and its fulfillment form the crux of the book 1. Book 2 delves deeper into the origins of the mysterious Nagas and their role in the fulfillment of the prophecy. Along the way our protagonist begins to realize that good and evil aren’t easily distinguishable. This book probably had the most shocking reveals throughout and as such was an absolutely stunning thriller! Book 3 essentially chronicles the final steps that the Neel Kanth must take to ensure that evil is no longer part of the equation to preserve the glory of India. There are a few reveals and shockers in this book as well, but not as many or as interesting as the ones in the first two books. The final chapter, which feels a tad like an epilogue, does give a suitable closure to a truly spectacular saga. Books 1 and 2 are superbly fluid and strongly engaging. Partly because the narrative is simple and linear. But primarily because of the slow and steady revelation of the mysteries that have been built and put forth in the opening chapters. By the time the story spans to book 3, almost all of the revelations have been made. So there is no mystery waiting to be solved. As such the elements of suspense and engagement are quite toned down. This was possibly a major reason why most readers felt that the final chapter in the trilogy did not live up to the glory of the first two. Although it would have been great that all three books were equally stellar, I really can’t blame the author. Trilogies are difficult. There’s only so much that you can do to sustain a story till the final page. Heck even great sagas such as The Godfather fell short of greatness when it came to the third instalment! Tripathi does a spectacular job of merging Indian mythology with the traditional hero on a quest plot. Humanizing the deities may have raised eyebrows and possibly angered some zealots. However I feel this element was critical for the success of the books. In fact I concur with Amish’s opinion that today’s Gods may in fact have been mere mortals like you and I and attained their holy stand simply on account of their actions and deeds of valor and sacrifice. The narrative provides rational scientific as well as etymological explanations for many Hindu shlokas, phrases as well as customs. This provides a grounded feel to an otherwise overly superstitious and deity driven religion. The entire trilogy is highly recommended to those of you who love fantasy or for that matter Indian mythology (Amar Chitra Katha fans, I’m looking at you!). But even if you aren’t a fan of the genre, give it a read. It’s absolutely worth your time!